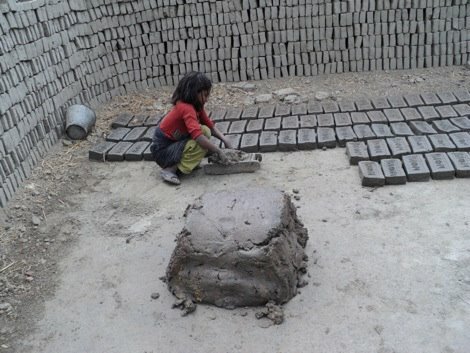 In March 2000 Denbighshire education officer David Phoenix visited Nepal where he witnessed hundreds of children alongside their parents on the Kathmandu brickfields making bricks by hand. They were living and working in the most appalling conditions. David soon discovered that there was no provision for educating these children and decided on returning to the UK that he would launch an appeal to raise funds to improve the lives of the ‘brick children’ as they soon became known. The money began to arrive steadily – sponsored walks, concerts, coffee mornings took place – and it wasn’t long before David had persuaded his then boss, Director of Education Edgar Lewis, to join him on a visit to Nepal. Following this visit a pilot project was started with the aim of establishing the viability of running a school in the district of Tikathli. This project was supported by the Rotary Club of Yala (Patan), the Rotary Club of Wrexham Yale and the district Red Cross of Kathmandu. When the school was opened parents were queuing in order to get their children enrolled and such was its success that it was decided to apply for charity status in the UK and to forge a link with what became known as the New Help Association in Nepal who effectively act as the school’s governing body. David and Edgar as trustees were joined by solicitor Pamela Valentine and their vision was to open the school to further pupils and to provide education outreach programmes for the parents of the ‘brick children’. David’s inspirational idea was slowly becoming a reality. By 2009 the school has grown from one with 89 pupils to one with 200 pupils aged from 4 to 14 years, from two teachers to seven and from one sewing class to the provision of adult literacy classes, two sewing classes, a first aid class and a health awareness class. Staff members at the BCS have all taken part in a programme of in-service work and school visits. Further such opportunities will be funded by the charity. A special thank you to Anita, Renu, Saruta, Sanita, Saradu, Bijeye and Parmila for all their hard work.